Saturday is our pancake day, and you can be sure Mauri’s variable pancake recipe invariably includes real buttermilk, which has become a staple in the Macy fridge—despite my well-practiced workaround. Ha! Thanks for the mention. 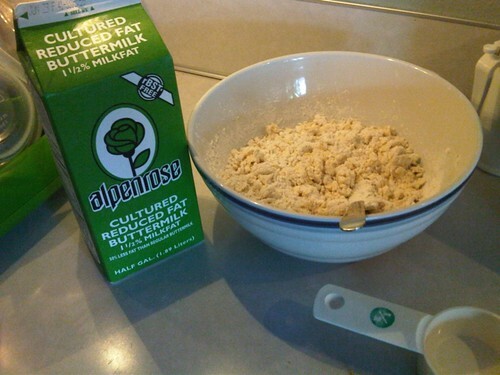 Here’s that powdered buttermilk product I mentioned. Maybe you should give it a whirl! this is interesting because i was just looking at that powdered buttermilk substitute seriously considering it. have a bbq recipe that is calling for buttermilk (strange, but got good ratings) and ultimately decided to spend 38 cents for a tiny bit of buttermilk rather than the 4 something for the can. My mom recommended using lemon with milk, but like Maury, I can’t bring myself to do that. there is some strange variable in cooking indeed. Jeff can’t bear to smash the garlic to get the peel off, like he is afraid to hurt it? even though it will go directly into the pulverizer. you say tomato, I say tomahto?